Moving Connections is your West Jordan local moving company. We’ve had our roots in Northern Utah for more than thirty years; this is where we started, and this is where we intend to stay. Moving Connections strives to provide the most professional, and yet affordable moving service. That is why we only hire professional movers who are experienced in the business. And that’s why our rates are transparent and simple: you pay for time plus boxes and tape. Moving Connections wants you to have peace of mind. So we are federally licensed, bonded, and insured. Moving Connections is sensitive to budgetary concerns, so we provide different levels of service for West Jordan residential moves. If Moving Connections is moving you to West Jordan it's a perfect time to begin to utilize the many resources and bounties of West Jordan. For example click on the picture to the left to go the Moving Connections 'Support - Advice - Assistance' page and discover West Jordan for the first time. Once you are on the 'Support - Advice - Assistance' page go ahead and open the .pdf link found there and tape the list of emergency and useful phone numbers on your refrigerator. Moving Connections has gone to great pains to find those links and connections to integrate you quickly into West Jordan life. So you’re expanding your business and you need more space, or you’ve got a better lease arrangement at a new location, or maybe you’ve found a new place that makes a better commute for you and your employees. Whatever your situation, you’ll do well to select Moving Connections as your West Jordan business mover. That’s because we’re a local professional moving company providing the highest quality moving service along the Wasatch Front. And while it’s legal to operate a moving business within the state of Utah without a federal license, isn’t it comforting to know that Moving Connections is federally licensed, bonded and insured according to federal standards? All this might make it sound as if we’re some impersonal entity that’s part of a national franchise chain. But nothing could be further from the truth. We’re a local shipping and moving company, born and raised here in the Mountain West. So you know that Moving Connections is local, accessible, and accountable. 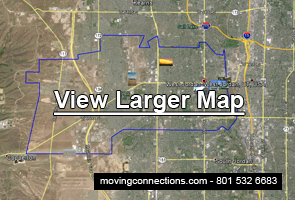 Make Moving Connections your residential West Jordan Mover. You’ll be glad you did when you see how smoothly a move can go with our experienced, professional West Jordan moving crew. And isn’t it comforting to know that Moving Connections is federally licensed, bonded, and insured? That should give anyone peace of mind, since insurance company homeowner’s policies might not cover moving services. Moving Connections has been performing local West Jordan shipping and moving services for more than thirty years. So we know how to make your local West Jordan move a seamless transition to your new residence.